A film about you that you will experience, not just watch. Unbelievable genius. 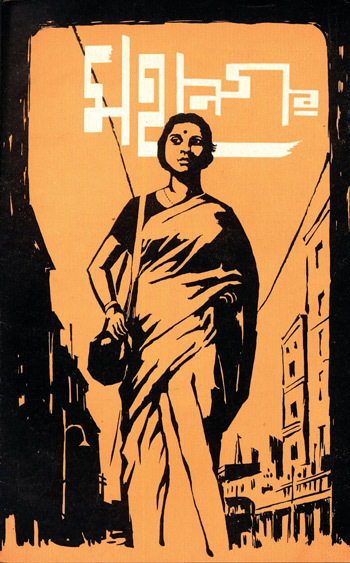 This was my first Satyajit Ray film, and I don’t have words to describe how I feel. At first, I decided not to write about it at all. What more could I possibly say that has not been said in praise of this masterpiece? And how in the world will I even gather my thoughts to talk about it? But I must try, that’s why I write here. Based on Narendranath Mitra’s work and set in Calcutta of 1950s, Mahanagar is a story of a lower-middle class Bengali family. Subrata Mazumdar (Anil Chatterjee), a bank worker, is working hard to make the ends meet for his family of six – his wife Aarti (Madhabi Mukherjee), his son Pintu (Prosenjit Sarkar), his sister Bani (Jaya Bachchan, then Jaya Bhaduri), and his aged parents. Aarti decides to take up a job as a sales girl to help her husband share the burden. But this change won’t come easy in a conservative family. This story of a family is many related stories weaved together. You might not relate to the specifics of the characters’ lives, but the underlying buffet of emotion is universal – love, agony, irony, anger, power, fear, dependence, independence, shock, relief. They cross all barriers of time & space and, in my understanding, that is why this film is timeless. The characters are you and I. The technical side of the film is equally brilliant. Almost every shot is a work of art. Be it the opening scenes, use of a mirror as a symbol of self-reflection, or the lipstick as a symbol of temporary change of a character, etc.- it’s nothing like I’ve ever experienced before. Subrata has asked Aarti to quit her job. She is in shock and dilemma. She loves the job. “What toy?”, Pintu esquires. Subrata wants her to quit. And all this was very subtle. Satyajit Ray knows how to get to your soul, even before you know it. Everything about the film comes together flawlessly; the film comes alive and isn’t a film anymore. It’s an experience and you’re in it. It’s as if you lived it. And we did, in some way or the other. Published on September 19, 2013. Updated on September 19, 2013.